Happy Sunday! Last week I got my second Pretty & Polished subscription box! This box contained two exclusive polishes, a mini thermal polish, a mini nail file, samples of handmade soap and cuticle butter, and some little nail studs! I decided to try on one of the exclusive polishes, just to give you an idea of what you might receive if you buy a subscription box. 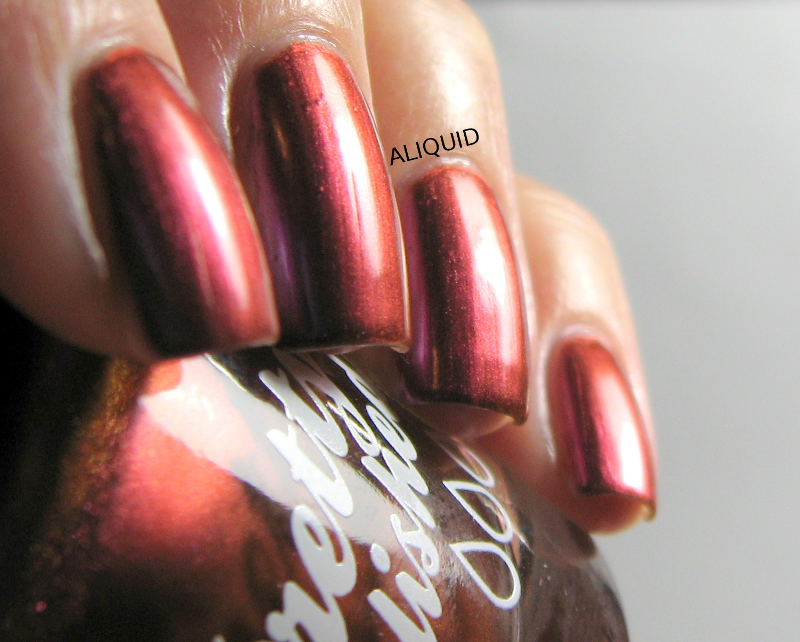 Life is a Bowl of Cranberries is a metallic polish that shifts from purple to burgundy to red and orange. It looks different in every light--love it! Pretty & Polished Life is a Bowl of Cranberries. Three coats with Out the Door topcoat. The formula on this polish was pretty typical for a metallic. I had to be careful not to use too many strokes for each coat to prevent dragging. I got some brushstrokes, but not too bad. Three coats were needed for opacity. This last photo is in indirect sunlight, where you can see the polish looks way different than under my lamp! Reminds me of a sunset! Since Life is a Bowl of Cranberries was exclusive to this month's beauty box, it's not available for sale, but you can sign up for the next beauty box and see what surprises you get! This is so pretty! Love how it shifts color depending on how the light hits it.